When 700 Australians volunteer to meet with their local politician, you know you’ve hit a nerve. 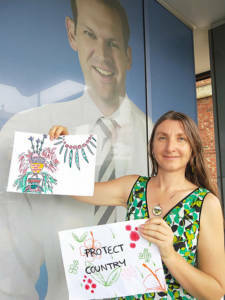 That’s what’s happened this month, when 350.org Australia asked its volunteers, activists and supporters to deliver a copy of a new United Nations climate report to their local federal representatives. Concerned citizens have already taken the report to more than 60 MPs and Senators around the country and more deliveries are planned. On October 8 the United Nations’ Intergovernmental Panel on Climate Change (IPCC) released A Special Report on Global Warming of 1.5oC. The report highlights the major climate disruption we will experience with global warming of 1.5oC and the substantial increase in global action required to achieve this outcome. It makes for pretty scary reading. Coral reefs are projected to decline by 70% to 90% with warming greater than 1.5°C. If that rises to 2°C, more than 99% losses are expected. A global warming of 1.5°C would mean an ice-free Arctic once in a hundred years. At 2°C that would be one in 10 years. The difference that half a degree would make is huge. Extreme heat exposure would be 2.6 times worse under the 2°C scenario – vertebrate species loss would double from 4% to 8%, plant species loss would also double from 8% to 16% and insects loss would triple, from 6% to 18%. Sea level rise would go up from 0.4m to 0.46m, while fisheries loss would double, crop yield reduction would be more than 2.3 times greater and permafrost loss would be 38% higher under 2°C warming. We are not working fast enough towards our global goal to reduce carbon emissions and time is running out. The fossil fuel industry is causing this crisis and if we want to keep global warming below 1.5°C, coal, oil and gas needs to stay in the ground. And right now, in Australia we are on track for 3°C warming and we’ve got about 20 years at best to take action to get temperature rise under a liveable limit of 1.5°C. 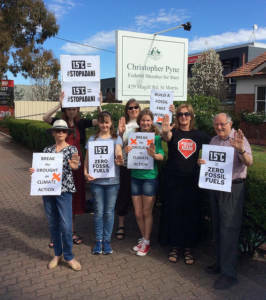 So it’s not surprising that so many people put their hands up take part in the campaign by delivering the report to their local members of parliament or senators. 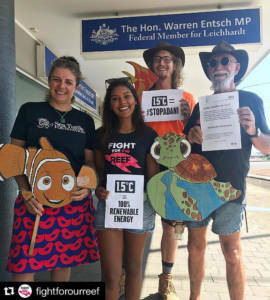 From Capricornia in Queensland to Dunkley in Victoria, to Casurina in the Northern Territory, Cowper in the ACT, Leichardt in Sydney, to Sturt in South Australia, Moore in Western Australia, and Bass in Tasmania, reports were delivered to politicians in their offices and at public events. It’s a big ask to get someone to visit their politician and requires a lot more effort on the part of the volunteer than simply signing a petition or sending an email. But we had such a passionate, rapid and overwhelming response, for several reasons. 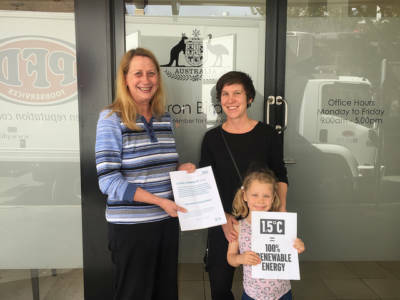 The IPCC report was released on October 8 and volunteers were able to deliver them to their MPs from the next day. We knew in advance the report would contain damning scientific evidence about the impacts of climate change and would be featured in the global news cycle for days. It’s also timely because the current government, with its one-seat majority, is facing a critical by-election in late October, and a full election by May next year. State elections will happen before then in NSW and Victoria. By acting immediately volunteers are able to help drive the momentum around the report, and increase its value. Being written by a team of world leading scientists under the auspices of the United Nations Intergovernmental Panel on Climate Change, the 1.5 degree report has strong scientific credibility. Volunteers know this report will stand up to scrutiny, and are prepared to invest their time and effort to be associated with it, by bringing it to the attention of their local MP. The report is a warning. Act now, while we can, before it’s too late. 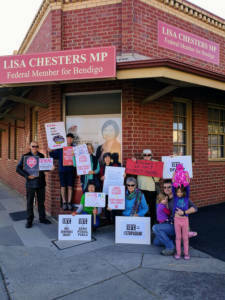 It is a strong call to action, and by taking it to their MPs, volunteers are putting it before the people who can make a difference by changing legislation. 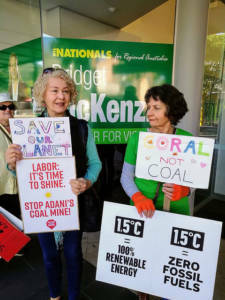 The Federal Government has the power to stop new fossil fuel projects around Australia, like the Adani coal mine and fracking developments in the Northern Territory. This report illustrates exactly why that has to happen. And by taking it to their local MP, volunteers localise this global report to every electorate nationally by showing MPs that their constituents care. Volunteers know that signing an e-petition or posting a comment online does not take any special effort. But arranging to deliver a report in real life, to an elected decision maker who represents them in parliament, take a significant effort. It takes time, personal interaction and planning. The volunteer knows it, and is keen to do something meaningful that is important to them. The politician knows it too, and regardless of their political stance, will understand that when a constituent is prepared to go to that much effort, it’s because the issue to important to them. As author Greg Jericho writes in The Guardian: “The IPCC report is not actually, as some would have you think, a prophecy of doom – it is a call for action. Rather than talking of what will happen if the planet warms by 2C above industrial levels, its focus is on how much lower the risks are if we limit it to 1.5C. And the good news is this can actually be done.” Volunteers want to contribute to solutions, not just highlight problems. Report deliveries didn’t just happen in Australia. They were coordinated all over the world. Being part of global action on a global issue is important to volunteers and it’s satisfying to unite with likeminded people doing the same concurrent event. The IPCC report had been planned many months. We knew when it was happening, we knew a lot about what it would contain, and we knew it would be bad. We had materials ready to go, had hosted webinars explaining to volunteers how to best tackle delivering the report to their MP, how to ask for an appointment, what they should do if the MP refused to see them and more. Volunteers who feel prepared and supported, are keen to act. Politicians visited include Kevin Andrews, member for Menzies, Vic; Nick Campion, member for Wakefield, SA. Ross Hart member for Bass, Tas; Tim Watts, member for Gellibrand, Vic; Ann Sudmalis, member for Gilmore, NSW; Shayne Neumann, member for Blair, Qld; Nicole Flynt, member for Boothby, SA; Trevor Evans, member for Brisbane, Qld; Mark Butler, member for Port Adelaide, SA; Warren Entsch, member for Leichardt, NSW; Kevin Hogan, member for Page, NSW; Bridget McKenzie, Senator NSW; LIsa Chesters member for Bendigo, Vic; Stuart Robert member for Fadden, Qld; Christopher Pyne, member for Sturt, SA; Graham Perrett, member for Moreton, Qld; Sharon Bird, member for Cunningham NSW; Matthew Canavan, Senator, Qld; Chris Crewther, member for Dunkley, Vic; Michelle Landry, member for Capricornia, Qld; Terri Butler, member for Griffith, Qld; Peter Khalil, member for Wills, Vic.